In my last post, I took the Wolterman male line back as far as I can at this point. 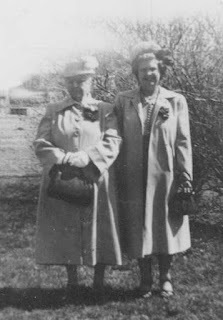 This week I will begin with Theresa Kathryn Determan, my husband’s paternal grandmother, and work back through the Determan side of the family. 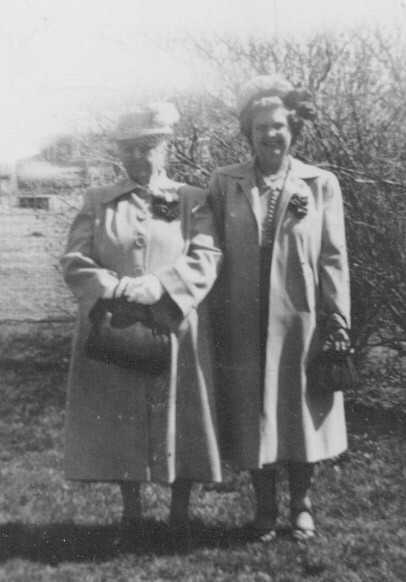 Theresa was born 17 May 1903 in Mount Carmel, Carroll County, Iowa to Johann August and Mary Anna (Luchtel) Determan. She joined older siblings Caroline born in 1891, Mary born in 1892, Frank born in 1894, Laura born in 1896, Elizabeth born in 1897, Edward born in 1899 and Clement born in 1901. Two additional children were born after Theresa: Martha in 1905 and Joseph in 1907. All of the children were born in Mount Carmel, Iowa, where they lived on a farm. The Determan family traveled by train to Butte, Nebraska in 1908 when Theresa was 5 years old. 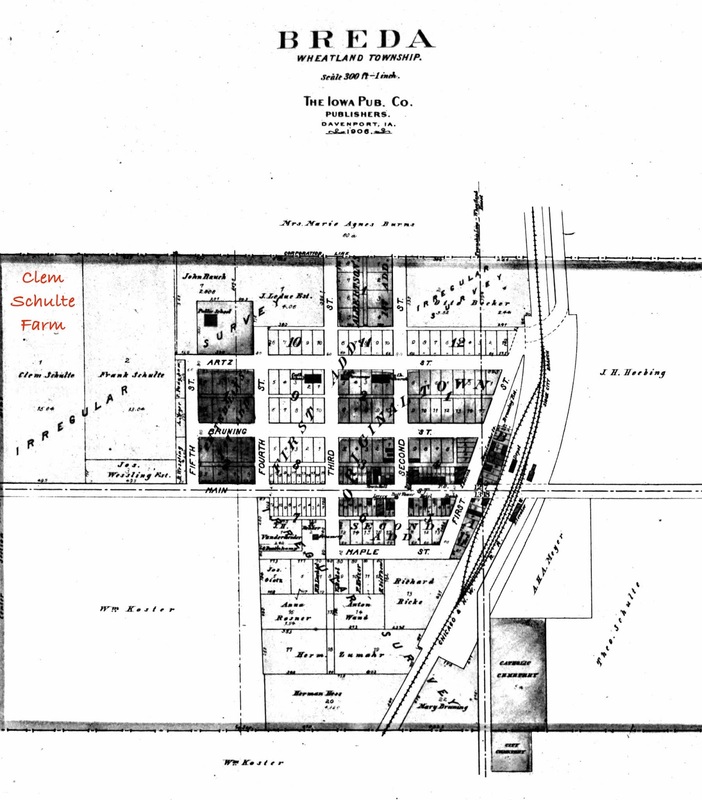 Johann (who went by his middle name August), established a farm in Butte. Two years later August died at the age of 42. Mary was only 37, but she continued to hold onto the farm with the help of her children and hired hands until 1917. At that point, so the family story goes, 68-year-old Bernard Clemens Schulte came from Breda, Iowa to visit Mary in Butte. His wife, Marie Elizabeth Determan, had died in 1913. Marie was the older sister of August Determan. She and Bernard had 12 children, and she was 51 when she died. Bernard proposed to Mary, and she moved back to Breda with the following children: Clement, Theresa, Martha, and Joseph. (August and Mary’s son Edward had died in 1900.) 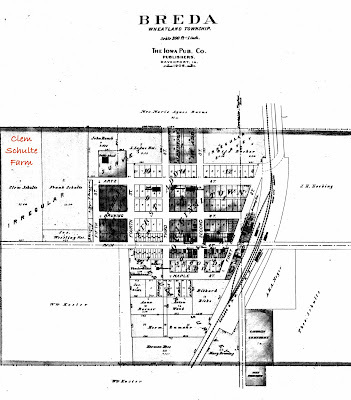 Her son Frank remained on the farm, and her daughters Carolyn, Mary, Laura, and Elizabeth had all married and stayed in Nebraska. 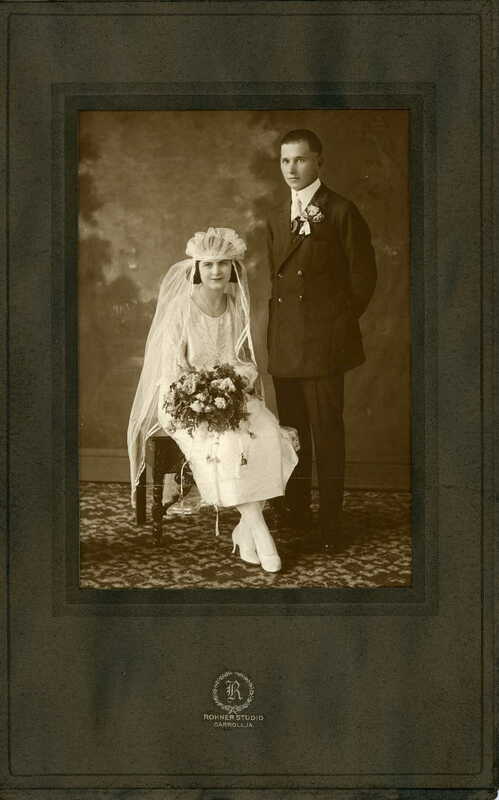 On 14 November 1917, Bernard and Mary married in Breda, Iowa. Mary was 44 years old at the time of her second marriage. At least 4 of Bernard’s children would have still been at home at this time. Theresa was in 9th grade when they relocated to the Schulte farm in Iowa. She later said that she and her siblings were happy to have a shorter walk to school in Iowa. In Nebraska it was 3 miles from the farm to their school. Theresa worked in a dry goods store. I've been corrected since my post about Frank Conrad Wolterman regarding how she met her future husband. She and Frank met at a dance, not a shower. They married on 6 June 1922 at St. Bernard Church in Breda, Iowa. From this union came 11 children, and as I explained in my first post, I am not listing the birth years of the children because some of them are living and I want to respect their privacy. During their marriage, Theresa and Frank lived in Maple River, Iowa, Breda, Iowa, Fonda, Iowa (on Moore's farm and later the Lampe farm, moving into the town of Fonda after a tornado damaged the house and 22 buildings on the Lampe farm), and their final move was in 1950 to a farm west of Fairfax, Minnesota. Frank died in 1964, and Theresa lived with her son Stanley on the farm for a while. 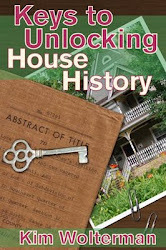 Later she lived in a mobile home before moving to an apartment. Her last year was spent in a nursing home in Mapleton, Blue Earth, Minnesota. Theresa died in Mapleton on 28 January 1988 at the age of 84. So as not to be redundant, you can read more about the life of Theresa and Frank by going to my first post, which can be found here. The last Woltermann male about whom I have information is Geert Jans Woltermann, my husband's 5th great-grandfather. What I do have on him is very limited. I know nothing about his parents, or when he was born. On 22 November 1765, Geert married Hindertje Michels. 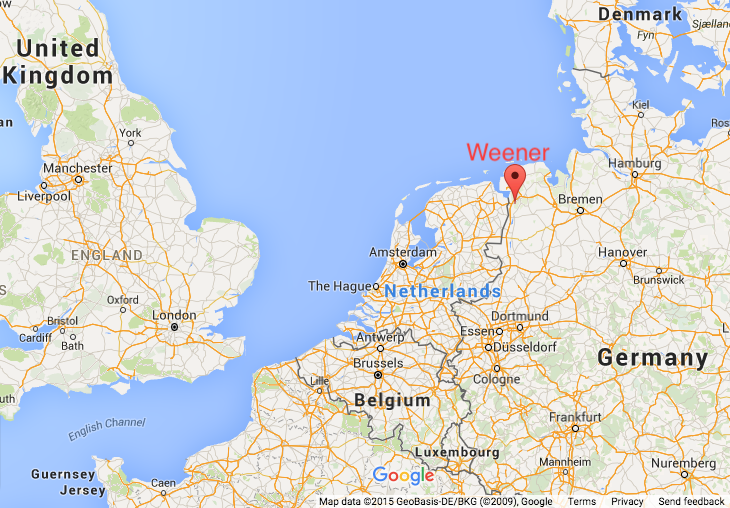 The marriage took place in Weener, Ostfriesland, Germany. As I mentioned in the last post, they had at least one child - Jan Geert Woltermann. To date I have found no records on the death dates of either Geert or his wife, Hindertje. The father of Gerrit Jans Woltermann, who I wrote about last week, was Jan Geert Woltermann. Jan was born 24 October 1761 in Mohlenwarf, Lower Saxony, Germany to Geert Jans and Hindertje (Michels) Woltermann. He was baptized 25 October 1761 in Hannover, Germany. 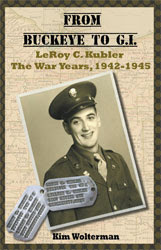 While he undoubtedly had siblings, I have not yet found any records for any brothers or sisters. On 6 May 1781 Jan Geert Woltermann married Gepke Boelen in Weener, Lower Saxony, Germany. The town of Weener is on the Ems River near the border of the Netherlands. Gepke Boelen was born 20 March 1760 in Tichelwarf, Ostfriesland, Germany. They had the following children: Gerrit Jans born in 1792, Jan born in 1797, and Hindertje born in 1804. 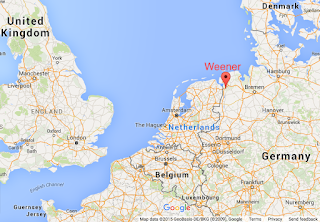 Jan Geert Woltermann died 8 July 1816 in Tichelwarf, Ostfriesland, Germany at the age of 54. It is unclear when his wife Gepke passed away.